Winemaker Dave Collins was probably the perfect guy to bring on board the Big Cork Vineyards team back in 2011 when the winery was first planting its grapes. He’d already been in the business for over 30 years, with his latest gig just across the Potomac River in Virginia — just 10 miles from the current Big Cork Vineyards estates. So not only did he come with winemaking experience, he was familiar with the terroir and what grapes would grow well and where. Obviously the pursuit was successful, today the winery boasts over 35 acres planted to vines with about 21 different grape varietals. Well, personally, I love a good Cab Franc. While they’re becoming more main stream, a single-varietal bottle is still a bit of a challenge to find. So I was most excited when the Big Cork Vineyards 2015 Cabernet Franc arrived in my Big Cork delivery. 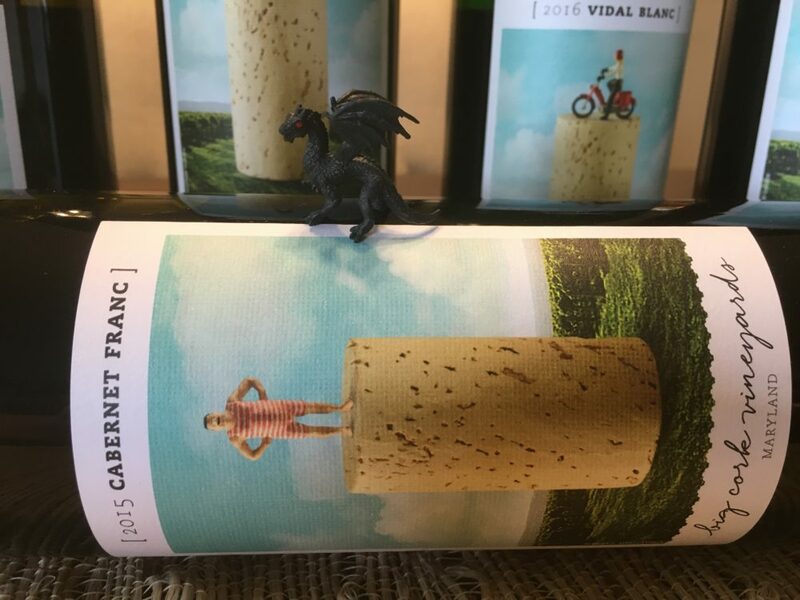 About the Wine: The Big Cork Vineyards 2015 Cabernet Franc is made from 100% Cabernet Franc grapes harvested from the Big Cork Vineyards in Central Maryland. The grapes were hand-picked, chilled overnight, hand sorted and crushed. The wine aged in combination new and neutral French and American oak barrels for 16 months. Flavor Profile: Pop the BIG cork and breathe in deep aromas of a rich dark meat umami, blue and blackberry compote, and a bit of burnt or crusted molasses. On the pour, the Big Cork Vineyards 2015 Cabernet Franc is beet-juice red with a ruby, gem-like luminescence. In the glass, the wine actually shows quite a bit of purple, creating a deep maroon color that is not at all penetrable. Along the edges, there’s a glimmer of hope with just a slightly lighter, flusher, red-violet. Initial aromas are still of that crusty-meaty umaminess, campfire smoke, roasted root vegetables, with just a hint of something sweeter. Swirl and find that something sweeter is the natural subtle savory-sweetness found in a beetroot. Additional aromas include macerated black cherries, mint leaf, and a background of warm autumn air. 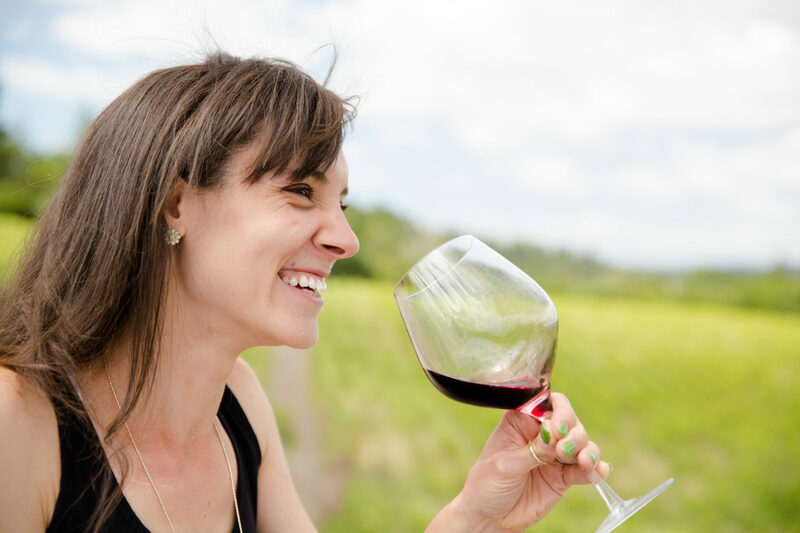 As you take the first sip of the Big Cork Vineyards 2015 Cabernet Franc, and you simultaneously breathe in for that mouthful, you’ll find the very subtle but structural aroma of green bell pepper. The tannins hit almost immediately: they are solid but light; soft like suede; and a uniform consistency from start to finish. Dominant flavors are of black cherry, peppercorn, firewood, cooked unsweetened cacao, with a finish of burnt coffee beans. Food Pairing: I paired the Big Cork Vineyards 2015 Cabernet Franc with a grilled filet mignon (medium rare), roasted fingerling potatoes, sautéed broccolini, and a beef stock mushroom gravy. Perfect pairing in my book. The broccoli seemed to calm the tannins while calling forth the fruits; the meat solidified everything, getting those tannins to work and form a purpose on the palate; the butteriness of the potatoes complemented the pure non-butteriness of the dish; and a bite of everything together gave the wine a fullness, a warmth — like a big bear hug for the mouth. More Info: I received the Big Cork Vineyards 2015 Cabernet Franc as a sample for review. (Cheers Amy!) Retail: $46 For more information about Big Cork Vineyards and to order wines directly, please visit the Big Cork Vineyards website.